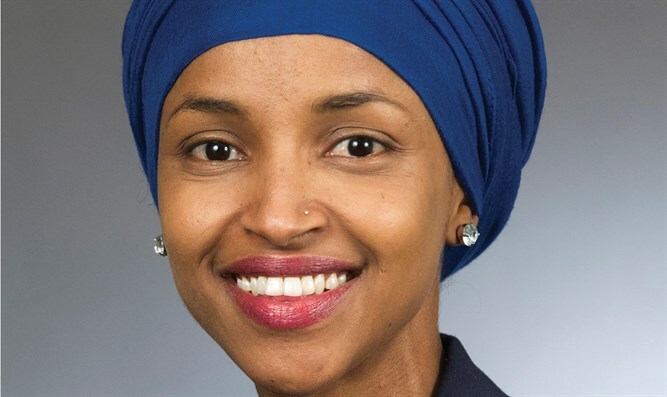 Newly elected Somali Muslim Congresswoman now says she supports BDS after telling synagogue BDS 'ineffective' before elections. Ilhan Omar, the newly elected congresswoman from Minnesota, said after being elected that she supported the Boycott, Divestment and Sanctions movement targeting Israel, after saying during her campaign that it was “counteractive” and prevents dialogue. Omar’s comment came in response to a website called Muslim Girl, which pressed her on her appearance during the campaign at a Minneapolis area synagogue, in which she had said that BDS “stops the dialogue” and is “counteractive” to achieving a two-state outcome. Like many other Democrats, she noted her opposition to anti-BDS legislation but framed it as a free-speech issue. TC Jewfolk, the local Jewish news website which originally reported her ostensible rejection of BDS, pressed her on the issue after the Muslim Girl statement in text messages which it posted on Twitter. The TC Jewfolk reporter pressed her further, asking Omar why she didn’t simply answer “yes or no” when asked about the issue at the synagogue forum for candidates. Omar is the first Somali and one of the first two Muslim women elected to Congress. The other Muslim woman elected last week, Rashida Tlaib of the Detroit area, also backs BDS. Omar has faced controversy and accusations of anti-Semitism for spreading conspiracy theories about the State of Israel and Zionists. In 2012 she tweeted: “Israel has hypnotized the world, may Allah awaken the people and help them see the evil doings of Israel."